It’s Fall! And for those of us in the U.S. that means shorter days and less light as the nights lengthen. There are several ways to approach this new lighting situation of the fall and winter months…avoid shooting in the evening, break out the flash, or….embrace it! I’m not going to let low light get me down. I don’t have an external flash, and I refuse to use the pop up, so, I choose to embrace it! I hope that after reading today’s tutorial, you will too! Low light photography is so much fun and isn’t as intimidating as it may first look. My first exposure to shooting in low light came about when I was shooting daily for a 365 project a few years ago. I would forget that I hadn’t taken a picture for the day and would freak out when I had nothing but darkness to shoot in. Or even worse, artificial light. Let’s say those images weren’t exactly the ones I’m most proud of. But now I realize that I just didn’t really know how to shoot in the available light that I had. 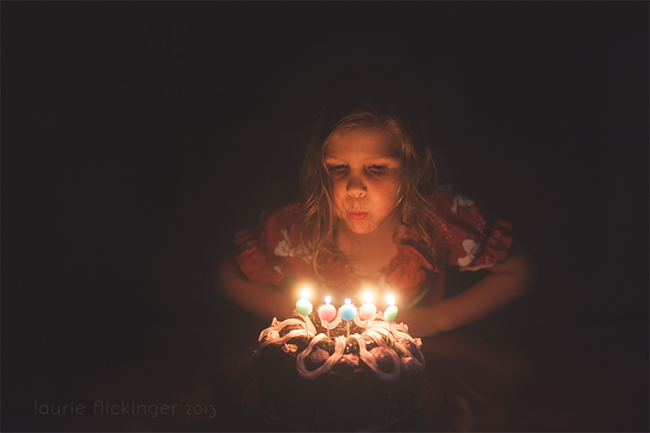 A little over a year ago, I took my first class at Clickin Moms where I was first taught how to shoot in low light, using available light, and creating desirable lighting situations in low light. After the class, my eyes were opened to a whole new genre of photography that I hadn’t really given much thought to before, other than to run away from it. 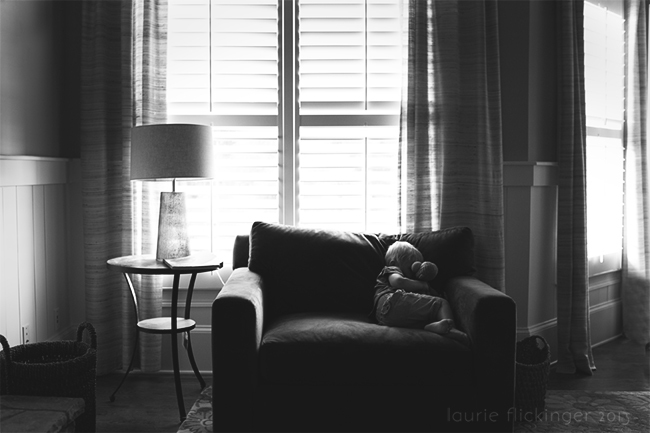 So, for today’s post, I’m going to answer the questions that I had when I first began shooting in low light. How Do I Expose for the Image? This part really freaked me out. It seemed simple enough, but when I was studying images that were shot in low lighting, I saw an image that looked as if it were exposed perfectly for that particular lighting situation. Using technical terms, the image appeared “underexposed” so that the image SOOC would match what the naked eye could see. By that I mean an image of a subject in dim light with the surrounding areas cloaked in darkness too. Well, it took me a minute to realize it, and I’m pretty sure the instructor had to explain it to me more than once, but that isn’t exactly how low lighting imagery works. I’m sure people do shoot in that way and it may work well for them, but for me, it didn’t quite work that way and it took doing for it all to actually click. And it was very confusing for me to see an “after” image and imagine the way that it was actually shot. Or maybe I just have a thick skull. Either way, I’m going to try to put it simply. Shoot as if your are shooting in day time! And for those of you who need a visual (like me)…here is a before and after to give you a better idea. The amount of lighting in the room looked pretty close to what it looks like in the final image. I overexposed in the SOOC shot to minimize the amount of noise. You’ll also notice that my shutter speeds tend to drop really low when shooting in low light. I’m aware of that, and do keep an eye on the shutter speed. Test your own limits and know how low you can go without camera shake. If you need a faster shutter speed, that’s okay! I could have bumped the ISO to 6400 and in turn moved my shutter speed to 1/40, but honestly it wouldn’t have made much of a difference either way. I am pretty steady at slow shutter speeds, my subject wasn’t moving, so I made a decision to choose decreased noise over a slow shutter speed. And because I can never choose between color and B&W. :) Here are both! Here is another SOOC. The scene is a bit darker than the previous image. I opened up my aperture more to capture more light. I was standing on the crib, I believe for this shot, so I kept my SS a little faster because I was doing a little balancing act to get this one. The is the final image and more like what I had envisioned when shooting the image. So, when I said, shoot as if it’s daytime, I mean shoot normally! Nothing has changed other than the amount of light in the room. Is your subject a person? Spot meter off of the skin and expose how you normally would. The SOOC shot may look nothing like how it looks to the naked eye, but it will be properly exposed. Using the Zone Method, and spot metering, that would be placing the skin somewhere around +1 for a caucasian subject. 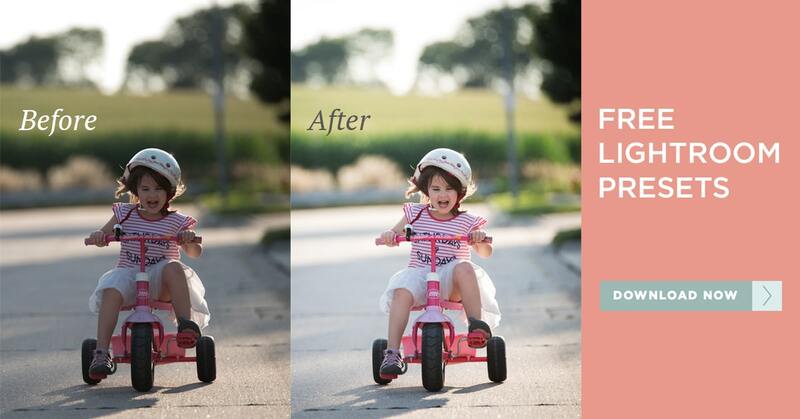 Notice how the before images are much brighter than the after images. Exposing the image properly in the beginning will give a much better end product. I also tend to expose to the right in any given lighting situation, which is really slightly overexposed. More often than not, I bring exposure down in post processing even in normal lighting situations. By doing so, I am packing as much information as I can into the raw file so that I have more to work with when I edit. 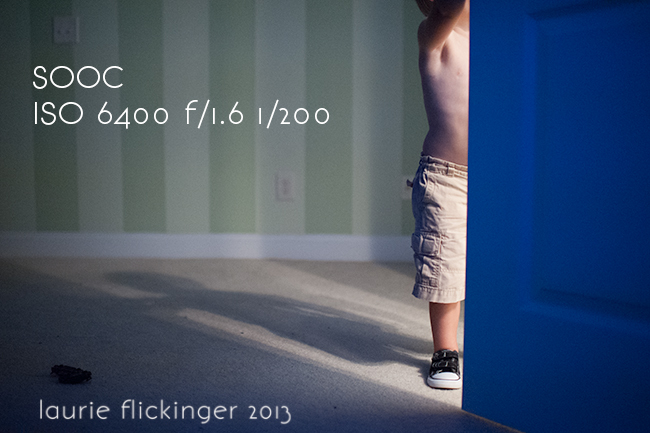 This is doubly important when shooting in low light. Remember, you can always bring the exposure down without losing information. 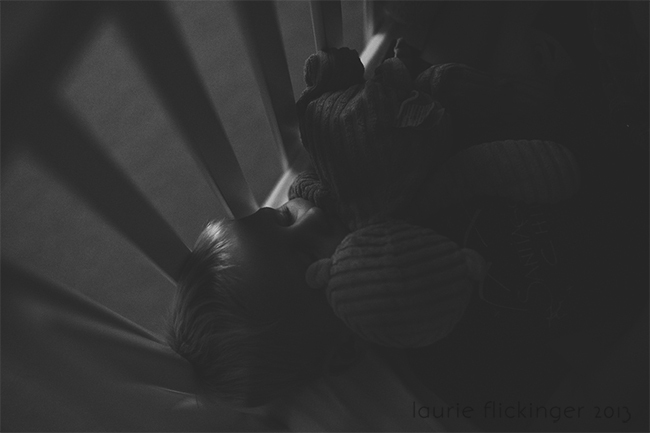 Brightening an underexposed image will result in lots of grain/noise. And not the pretty kind. So, by exposing as you normally would in a much brighter lighting situation, you are protecting your skin tones and decreasing the amount of grain overall in the image. the majority of the time. I set my exposure, cover the lens with my expodisc, point my camera toward the main light source and set a custom white balance (CWB). Now, I’m ready to start shooting. Setting a CWB and exposing skin properly will give beautiful skin tones, even in low lighting. If your image is underexposed, your skin tones will likely be a mess, and require more time in post processing. Okay, this image probably isn’t the best example of skin tones, but this was a creative choice to maintain a warm glow due to the candle light. What about Grain or Noise? The best way to minimize grain is to ETTR (expose to the right). ETTR simply means overexposing, and checking your histogram and blinkies until important areas in your image begin to blow. Next, take the exposure down by 1/3 stops until those areas are protected (or not blown but on the verge of blowing). For example, if exposing for skin, overexpose until the brightest area of the skin has blinkies. Then bring exposure down by 1/3 of a stop at a time until the skin is not overexposed. The image on your LCD will likely look brighter than the image you are envisioning as an end product, but this technique will help minimize grain as much as possible (without using Noiseware or any other noise reducing software). and did a CWB off of the lighting coming from the bathroom (very yellow). There was a little bit of ambient light coming in from the windows in the room. The difference in the lighting temperatures caused the door to look really blue, as well as the shadows in the SOOC image. 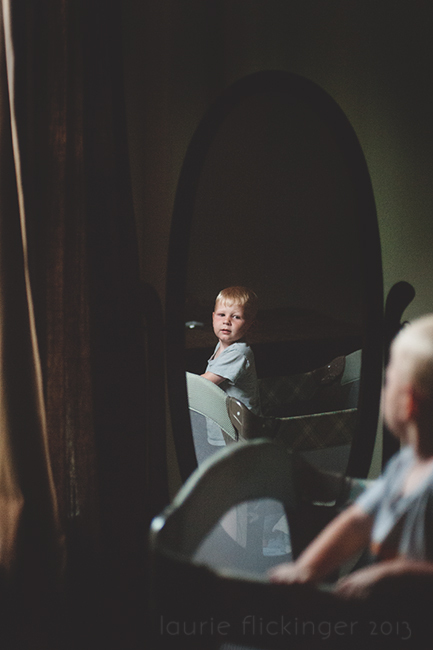 Notice how you can see the grain in the SOOC image. When I bring the exposure down, the noise/grain is much, much less noticeable. 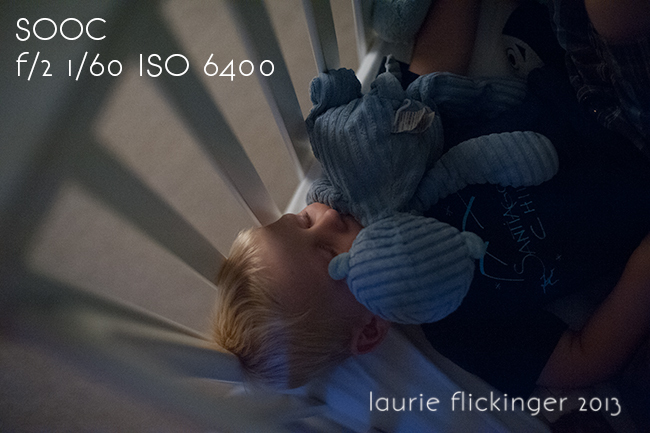 This is an example of how ETTR can minimize noise in your images when shooting in low light. Don’t be afraid to lower the exposure. That sounds like a really silly statement, but I had a hard time pushing the image in the direction that it needed to go. Now is the time to make the image look as it did the eye (and better). Lower the exposure until it looks more like you had envisioned. Then play with the tone curve to even further your vision. 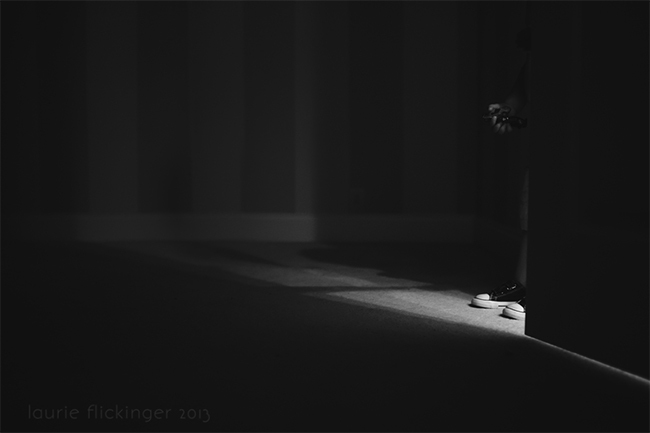 I tend to deepen the shadows even more and brighten the lights a tad for more contrast. While still in LR, I decreased the exposure to look more like I had imagined. The white balance is a mess from the mixed lighting, so I decided not to change that and instead convert to black and white. Once in Photoshop, I cleaned up my background using the clone stamp. Next, I played with a curves layer until I liked the contrast of the image, added a matte finish in levels. Last, I sharpened and saved. Beware when sharpening a low lit image. Due to the nature of this type of image, especially if if hand held and relative short exposures, there will likely be some degree of noise/grain. Sharpening the overall image will accentuate that. I choose to only sharpen select areas of the images. In this one, I only sharpened his shorts. 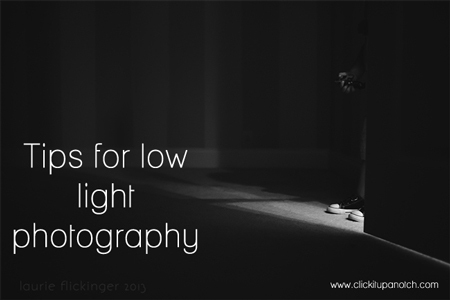 Hopefully I have answered some questions about shooting in low light situations. Leave any additional questions in the comments and I’ll do my best to answer them! Wow. This is completely mind blowing! GREAT article. I have always seen these amazing low lighting shots and I thought those photographers had to just sit around with a tripod and a super long exposure to make those happen. I had no idea. Thank you so much for explaining this to me. I love the look and feel of those shots but I have never been able to match my end result with the vision I have when shooting. They are always underexposed and grainy because I was trying to create that moody feel in camera instead of exposing for the lighting situation that was available. Thank you, thank you! Oh, I loved this article. I didn’t exactly understand everything but I’ll definitely be practicing and rereading it. Thank you so much for sharing! Let me know if you have any questions! I’ll do my best to explain it better! Different cameras max out at different ISOs and have different steps in between. Full frame cameras actually max out around 128000!!! (but doesn’t necessarily yield a great image) :) Give it a whirl! Thanks for this post! I enjoy shooting in low light, and ETTR makes sense and is something I will have to try. I also appreciated the advice about not sharpening the whole image. Thanks! Thank you for this article. I just had a Ah ah moment last week. Im a low light photography lover too! Im going to use those tips and im very excited about winter coming soon this years because im not affraid of low light anymore! Which class was the one you took at CM that inspired this line of thought? Thanks for sharing! This is some really great information! 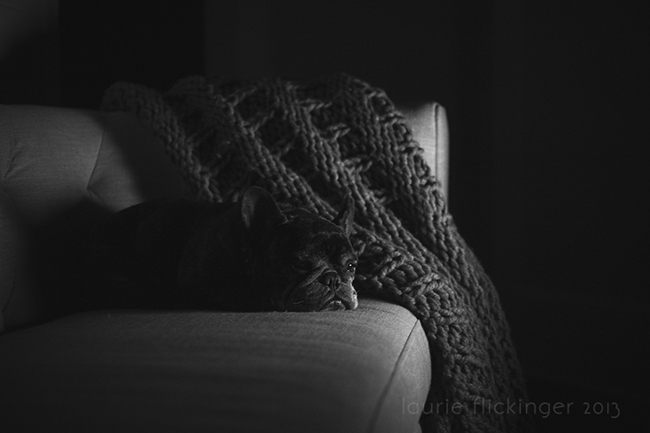 My biggest problem is focusing in low light situations. My camera seems to really struggle with it. Any suggestions, other than just good old fashioned manual focus? Good question! I should have thought to add that! 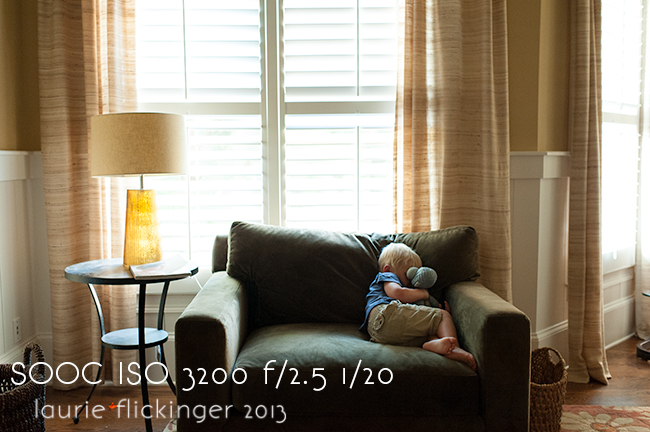 Cameras do have a hard time finding focus in low light situations. While, I do at times use manual focus, most of the time I have pretty good luck with autofocus. Look for an area of high contrast. The more contrast, the easier it is for the camera to lock focus. Certain focal points are better for focusing too. Check out your camera model and look in the manual or online to see which focal points are crosshair focal points. Those are the strongest focal points and can lock focus much easier. The center focal point is usually a cross hair focal point. Lastly, I have found that different lenses are better than others. I know that my 105mm searches a good bit, while my 50mm and 85mm are much faster at focusing. So, trying out different lenses may help too. Hope this helps a bit! I might go back and add this question back into the original post. Love this article Laurie!! Low light is one of my favorites!! And these shots of yours are ah-mazing!! (as usual)! Great post! 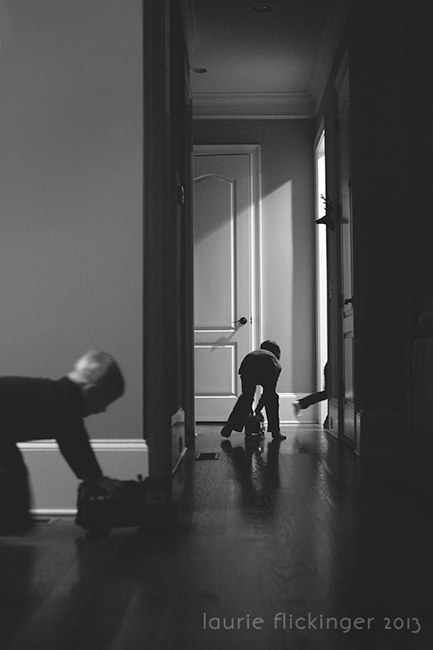 I usually don’t go below 1/100 because my kids are so crazy, but in the shot down the hallway, the center child looks pretty sharp even though he’s moving, at 1/30. I am definitely inspired to try more indoor! One question about ETTR… I don’t want to sound stupid, but i think to the right on my camera is under exposing. I’m just wondering if I’m thinking of it wrong, or does the term come from traditional camera metering. Thank you so much! This is really helpful. I had to read it twice to get a grip on it, and I think I will have to implement these tips for it to click. Thank you very much! I love this info. I gave it a shot tonight in my son’s room and all the settings seemed to be right but the camera refused to snap the shot. Suggestions? I have a Nikon D5200. Was there trouble locking focus? Sometimes you can’t snap the shutter if it isn’t in focus. Sometimes in low low light it may help to shine a flashlight or something brighter so that the camera has an easier time finding something to focus on….or you can give manual focus a try! :) hope this helps! Thank you! This helps someone like me a lot. Lighting is very difficult for me. Thanks for sharing! I didn’t read all the comments… So it may have been asked. But when you ETTR are you over exposing it under? Hey! This is great!! I love how you can touch upon “fears” that people have of certain settings, and make it seem more do-able :) it really got me excited and motivated to try and shoot in lower light settings! Thanks for the post, great photos! I must practise more in low light situations! I love that you only have primes, they rock! Having a look at the 105mm now…. I am not sure if you will still respond to these articles or not but I found this article so helpful and inspiring. I am very new to photography and was so inspired by your article that I took my camera off Auto and started shooting in manual the first week I got it! So many options! I am having a little trouble with my camera focusing in these low light situations. I really want to capture my little 9 month old in his crib while he is sleeping but am wondering if my equipment just will not do it because there is so little light. Any suggestions? Thanks so much. in which mode you take low light photography ?